This improvhi workshop will focus on several types of openings for long form sets. Players will have the opportunity to explore different ways to generate information for a fun and idea filled show! Participants should have some long form improv experience. Start off the new year with some IMPROV AWESOMENESS! Great way to meet and mingle with fun folks! Sign ups will begin at Arts at Marks at 6:45pm. Once the list is filled, the workshop will be closed. Open to all levels! Come out to learn something new or freshen up your chops for the new year. LET’S PLAY! This improvhi workshop will focus on several types of openings for long form sets. Players will have the opportunity to explore different ways to generate information for a fun, focused and idea filled show! When the moon hits your eye like a big pizza pie that’s…IMPROV! Join us for a special LOVE THEMED musical improv comedy show at Arts at Marks in Chinatown. Perfect night out for couples, singles, awkward dates and more! 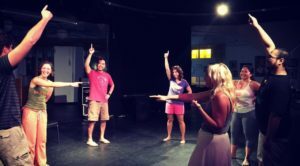 In this two part workshop, students will learn the basics of musical improv comedy. This class will focus on song structure, on the fly group movement, building want songs, and incorporating songs into scenes. NO MUSICAL TRAINING REQUIRED*. Seriously. This will be a fun, non-judgemental space where you will be to express your voice the way you want to. *Participants should have some theatre or improv knowledge. We’re heading back to our birthplace for a FREE Improv Comedy Show! Back in 2012, improvhi.com was created in a little Kaka’ako co-working space located at 685 Auahi street. When that place closed down, improvhi.com returned to that same address to ANOTHER co-working space to teach classes and hold shows. Once again…685 Auahi Street calls us back to the arms of their new tenants…MORNING BREW! We LOVE the Morning Brew team and CAN’T WAIT to partner up for a one night only (for now) comedy show! FREE! FREE! FREE TO MORNING BREW CUSTOMERS! Grab a drink, eat a snack and laugh your booty off with us. PARKING: SALT Parking Garage or Street. Recommended for 18 and over. We’re bring back the “Improvhi Test Kitchen!” A casual showcase where local folks whip up an original and delicious improv or sketch comedy recipe and YOU get to taste it! Got an improv form that you’ve been wanting to try? Or maybe a sketch that you want to put on its feet? Come on by and test it out. Open improv jam to follow. NEWBIES VERY WELCOME! Sign ins begin a 7pm at Arts. Each form or sketch will get about 12 minutes to play. Possibly more depending on the amount of sign ups. Come out and support local comedy and the arts! Join for the opening night (and sadly the closing night) of OTTO CAKE: THE MUSICAL! This entirely improvised musical comedy will feature everyone’s favorite rockstar cake maker! Everything from the lines to the lyrics to the music to the fancy dance moves will be completely made up on the spot.